Here $msg_id from the database more details take a look old post. <input type="submit" value=" Comment_Submit "
why we should use multiple form in one page? is it recomended? Can not we prevent using multiple form in a single page? 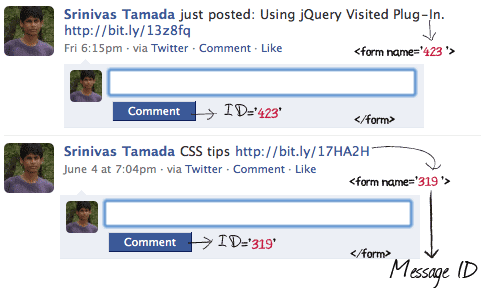 Nice implementation of jQuery!! one thing that's needed is when a comment is submitted, the text in the textarea should be cleared. how can I send more than one data in same post? For example one more input text. this look fantastic - but I need help with install please! could you explain for a beginner how to fix this? I love the script, still trying to understand it 100%. I have a table in my database for comments which includes something like (comment_id, user_id, comment, date). It appears that this script shows the comment after you post it; however, it will not post to my comment table in my database, which obviously means the comment disappears when you leave the page and return. Good stuff, but I would like to know how to create the same thing with the ability to submit by hitting the enter key rather than clicking a button. I'm using this script for handle all my forms on the whole webpage. It suddently should more dynamic to grab all keys and values from the form, you have submit, in one time. how can i grab all fields + values from the form at one time and put it in: var dataString? Hmm, this doesn't seem to be working correctly for me - it seems to be submitting the form x number of times (where x is the number of forms on the page). i think it'll be better if you add delete button to remove some "comment" .. But, I had included this script into div of "Update and Delete Records with Animation Slide Effect using Jquery and Ajax. ". Everything is well in IE, but in Firefox makes submit to whole page..Can you help me with this please? But thanks for giving this info.There are definitely some more details to take into consideration. It was really an interesting and informative article. Pretty cool post!Thanks for sharing this. I love seeing blog that understand the value of providing a quality resource for free. It is the old what goes around comes around routine. Did you want to acquired lots of links and I see lots of track backs?? Not a big fan of Ajax but I have to admit is very useful. Love this article. You saved me loads of time in creating a facebook like wall for my social networking site. Now all I need to figure out is how i'm going to be able to delete the comments. Wow great, worth checking, Thanks! really love to read articles that have good information and ideas to share to each reader. I hope to read more from you guys and continue that good work that is really inspiring to us. It is really useful to know that Tribal Fusion represents over 1500 web publishers worldwide. So i just wanna say thank you for the data that you simply have been sharing. Thanks. That’s great info for a newbie like me. I even like how you segmented your blog clearly… I’m still trying to get mine that focused. I guess it’s all a work in progress. can I have some more information about the inserting in the database!!! How i will insert the reecomemnt of the primary post in the database!!! thanks!!!! What is the database, can someone tell me please?! Your ideas are brilliant. I agree with your thoughts. Use it inside the function which processes the request and sends it to ajax. thanks for the valuable share here. I worked with Jquery but this stuff i always find difficult to go on.SO i better stick to the Sqlite Manager. jquery was a great problem with me while working on my final year project.But now i am quite proficient on it. Very knowledgeable information about jquery. Now we can submit multiple forms with jquery. Its really very interesting. Thanks for the tutorial. Learned a lot more on how to use Ajax and Jquery. I have a question: how to make the DIV refresh (calling a PHP page with variables) after uploading a comment?? This is just the script I was looking for! You have no idea how many headaches you have just saved me I have been trying to finish a project for three days now. Using jQuery for submitting muliple forms sounds like a great technique for user information input. It is my great pleasure to visit your website and to enjoy your excellent post here. I am happy when reading your blog with updated information. Very interesting article. It’s funny how history can be twisted in so many different ways. I love your article. It can help me get much useful information. Pretty fine post. I just stumbled upon your blog and wanted to say that I have really enjoyed reading your blog posts. Any way I'll be subscribing to your feed and I hope you post again soon. ajax, is the way to go. Many developers like using ajax. If ok you can split page reprivo 1 2 3 4 next for comment? This is amazing. I've been looking around for a good ajax form submission script that supports multiple forms on the same page. This is the perfect solution. Thanks! sir, how about with the same form name and action?is it possible that i have multiple forms to submit at a time and still it saves the data in the db sent by multiple forms? hoping for your response sir..thank you..
Hey Bro, really cool! Very convenient and easy way, thanks! Amazing tutorial, you make everything so simple. This is a useful script. I have used it on my blog.thank you very much. recomended? Can not we prevent using multiple form in a single page? e textarea should be cleared. Wouldn't you want to use an array? The inputs would be in the order they were serialized and one more input text. In order to submit multiple forms at the same time you'll need a function that invokes the submit events of each form.The jQuery plugin add an event listener to the onsubmit event of the form(s) you specify. Thank you for sharing this code with us. I do appreciate it. it says "No database selected"
This is one of the best post I've ever seen, you can include some more ideas in the same theme. Your post has helped a lot! thanks! How can i deal with "radio button" along with the comments right in the same way. Hi! Your post helped me too much! Nice article!! Thz u so much ... a good idea to handle multiple records. Hello!Please can anyone help me to do this work with jsp?I have searched in google but i can't find something like that.I want this tutorial but i want to integrate in jsp file using struts.Please Help! I just experienced your blog as well as cherished this a great deal. I bookmarked it, keep up the great function! Great info i have got here keep it up. Thanks for sharing! I also looking for the code to fetch the multiple data from database. how can I upload multiple photo? Its great I have same problem but after read this article. I solved my problem and I really like your informative article. Thanks for with sharing us.